For Valentine’s Day this year, my husband Ray took me out to dinner (Italian – yum!) 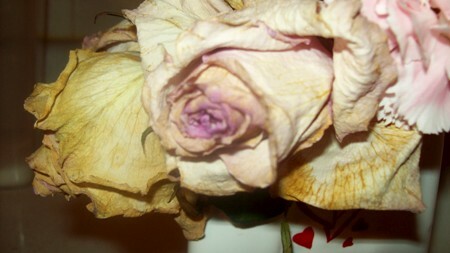 and ordered me baby’s breath and long-stemmed, red roses online (my favorite flowers). 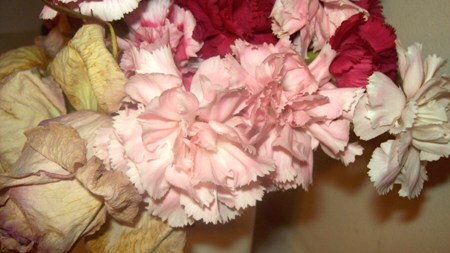 Unfortunately, the company messed up the order and to Ray’s chagrine, his gift for me came, but they were pink roses (cut very short) and pink and red carnations, with greenery. 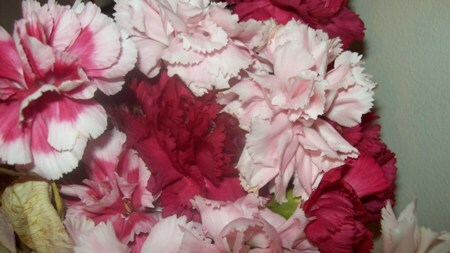 I don’t like the color pink at all, but still appreciated what he did because I love fresh flowers. 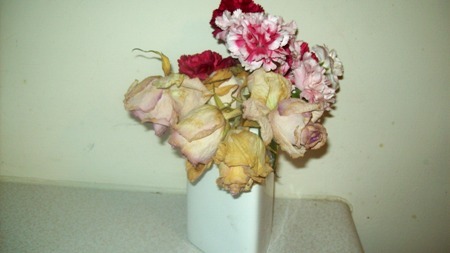 The flowers are now drying out and they are actually becoming prettier – the roses a yellow-pink with a purple-ish hue (my friend Jo-Jo would be happy about this; she loves purple) and the carnations a maroon-red. I rearranged a few of them in a different vase, and put the petals that are drying and falling out in an antique crystal candy holder that belonged to Ray’s grandmother, for decoration. When the last petals dry out, I’ll put them in the crystal bowl, too. I love beautiful things. We all do. Our atmosphere can deeply affect us – our home, our work, our business, even as we sleep at night. One of my new favorite authors is Alexandra Stoddard. Some of her books are a little dated, but I still love her writing. Several of her excellent books are on decorating the home and office, family, travel, and the writer’s life. “One of the riches ways to find your personal style at home is through association. You can be in a garden and decide that it has the mood and spirit you’d love to create for your living room. You can choose sun-drenched flowers and use lots of chintz and botanical prints. Your house can be like a beach on a deserted island. “Suddenly you become aware that your need for simplicity or an island escape far away from noise and pollution can be translated into wholesome, simple rooms at home. What you enjoy doing when you are away from home affects how you express yourself when you decorate. Your library can be done in rich greens, reminding you of the mountains. Beauty that moves you, like Melissa at The Inspired Room always seems to capture. When we surround ourselves with beauty, it’s like it soaks into our skin, our minds, our emotions. It soothes and calms us. It speaks to us and uplifts our mood. Our atmosphere even affects our work. This weekend I just listened to an audio by Cindy Rushton,Organization 911: Help For the Messy Mom. When we are facing clutter, dirt, and disorganization, we can’t think well or be as productive. The chaos around us causes chaos in our souls. We can’t tackle the next thing on our to-do list if we are stressed out by the mess on our desk, in our kitchen, or in the family room. When we bring order and beauty to our environment, it brings order and beauty to our work, too. It influences your work in positive ways, Stoddard writes (p. 198). A vase of fresh flowers. Flowers bring life, a creative touch, and beauty into a room. Beautiful paintings. I have replicas of Mona Lisa and Van Gogh’s paintings like The Starry Night. You can find these at Kohl’s, second-hand stores, or even garage sales at discount prices. A sachet of your favorite scent like lavendar, cinammon, myrrh, lemon tucked inside a drawer or sitting on a table in your favorite bowl or basket. Add a couple of coats of bright paint to cabinets, old chairs, mirrors. It’s amazing what paint can do for a room or furniture, and it’s not expensive. White can open up rooms. The colors of a room really affect your emotions. Windex the windows and buy pretty, new curtains for them. This week I took down the heavy, old (dusty!) curtains that I think may have been here since this rental house was built (1960’s!) and draped a single, wine-red, silk curtain across the black curtain rod, that had been stored in the bathroom cabinet. The room instantly had more light and looked better. It is my personal taste and made me feel better right away to be in the room. Use your favorite scented candles from PartyLite or Scentsy. Add bookcases and your favorite books. Books are like friends to me. The sight of them immediately makes me feel happier. Be sure to add even some of your childhood favorites. Set out a pretty little basket and put postcards in it, with a sheet of stamps. You can write a short encouraging note to a friend when she comes across your mind. Letter writing and sending postcards and notes have almost become a lost art. Personalize your work space with pictures of your family, brightly colored, cute folders, organizers. Tame the paper tiger by finding a home for each piece of paper. Get it under control. Learn the power of throwing things away and organizing. Use pretty paperweights for your desk. One of the little special gifts our daughter Heather bought me at Christmas was a square, green paperweight with the letter “B” elegantly inscribed on it. If you collect Willow Tree Angels like I do, have one sitting on your desk. My Willow Tree Angel, “Wisdom,” is sitting reading a book. I love looking at it as I do my work. Chaos and dirt are depressing and ugly. Keep your space clean and smelling sweet. You will concentrate better instead of thinking about how you really need to dust your laptop or move that pile of papers and folders somewhere else because it’s so distracting. Get a live plant. Melissa Ingold and Nicole Dean say it cheers them up in their offices. They can also eliminate air pollution. They can bring color to a dull-colored room or an office with fluorescent lights. For some right-brained, creative, artsy types, having a “perfect” desk or home would be like water-torture. They actually think better with their favorite things in physical view. But at least get messes under control! Use baskets, boxes, tubs, jars, portable filing cabinets, and other organizational helps. Penelope Loves Lists has really cute stuff you can use for your desk! Okay, now let’s get off here and start expressing ourselves in our atmosphere – decluttering, organizing, cleaning, and creating beauty all around us.